Happy St Patricks Day! Find The Pot Of Gold! Get 50% off! Well bless my blarneys! It's St Patricks Day! Its time for the annual Eryck Webb Graphics St Patricks Day 'Pot of Gold Hunt' that begins NOW! 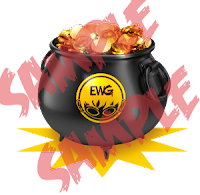 A leprechaun has hidden a special EWG branded pot of gold somewhere deep on this website where no human will ever find it. If you are lucky enough to catch a glimpse, you get 50% off your next invoiced character art commission order. The 50% discount applies to the whole order, whether its for one character or multiple characters!!!!. So get hunting!!! - You must find the Pot of Gold in the specified time to receive the discount. - You must use the discount by the end of 2016. It does not carry into the new year. - The discount can only be used once per customer. be able to use it again for yourself. - It applies to one EWG invoiced paypal order. (March 17th 2016) to qualify. - The event posts/launches at 11:59 pm EST on March 16th and only lasts 24 hours! my big day quite nicely. Ya really dropped the blarney stone this year me thinks... coulda done another nice St Patty's themed graphic to celebrate but nooo, just sending everyone after me pot o' gold it seems. A darn shame.... good luck finding it you buggers!"